Bells Rock Lighthouse was built in 1881 on the York River 2 miles downriver from West Point, Virginia. It was a hexagonal screwpile lighthouse. 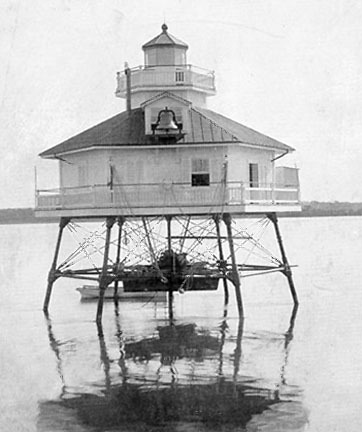 The first lighthouse was assembled in 1880 at the Lazaretto Depot in Maryland but was diverted to Thimble Shoal after that lighthouse burned down. The second lighthouse was built in 1881 and shipped to Bells Rock. It had a fourth order Fresnel lens. In 1884 a schooner hit the lighthouse and several support columns were broken. The lighthouse was dismantled in 1928 and replaced by an automatic light on the original foundation. The current light can be viewed from shore near Belleview, Virginia.